As a physician coach, I work with people who are overwhelmed and burned out. The solution is often simpler and more available than they ever imagined. During a recent broadcast, travel expert Pico Iyer discussed his decision to move from New York City to rural Japan. He loved the excitement of the city but admitted that living in NYC was a lot like eating potato chips. It’s hard to eat just one. He found himself “addicted” to the fast paced life and decided to remove himself from the endless temptations and try living in a quiet place with very little stimulation. Decades later, he remains in rural Japan, happy and more balanced in his life than he was in the midst of New York. Dr. Wendy Mogul recounts her experience of withdrawal from the pressures and frenetic activity of everyday life in her book, The Blessing of a Skinned Knee. Having grown up in a secular household, Dr. Mogul longed to understand her Jewish heritage. While studying ancient Jewish writings, teachings, and practices, she came across the idea of the Sabbath. As she instituted a weekly “day of rest” in her family, she immediately recognized the enormous benefits: removal from the demands of daily life allowed her entire family to reconnect, enjoy simple pleasures, and become rejuvenated for the coming week. 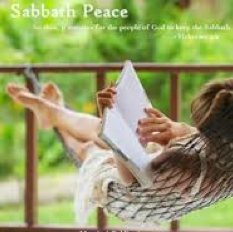 Increasingly, people are observing “secular Sabbaths” – days off from technology, a day with no plans, simpler vacations that involve true rest and relaxation. In the professional world, a 6-12 month period called a “sabbatical” is often offered or ordained for professional renewal. We each have the opportunity and power to regularly give ourselves the same gift. True, we might feel committed to many interesting and demanding activities. Most of my physician coaching clients feel their work is never done, that they can’t spare even a few minutes for “free time.” The result? We feel overwhelmed and burned out. That makes it even more important to unplug, disconnect and set ourselves free from the demands and worries these ongoing activities bring. Giving ourselves a break allows us to return in a more refreshed state, often inspired by something we experienced, with greater clarity about the project, and usually with enhanced resources of energy. Time off doesn’t have to require a planned vacation or days off work – an hour or a half day is great. Even a short walk in a beautiful area, a few minutes listening to music that fills our souls, an experience that makes us laugh out loud – all can be mini “Sabbaths” that restore our connection with ourselves and give us the respite we need. Once we begin to include those times in our life on a regular basis, we realize how important they are. When I finish writing this post, I’m turning my computer off, closing my eyes and listening to Bach. When do you have some time for your own “sabbatical?” A few minutes, an hour, a half day – pick a time and put it on your calendar. It’s as easy as that. Oh, how different our lives will feel with this one simple shift. This entry was posted in Doctor Coach, physician burnout, physician coach, physician coaching, physician fulfillment, physician work life balance and tagged Doctor Coach, medical career, physician burnout, physician coach, Physician coaching, Physician fulfillment, Physician work life balance, success. Bookmark the permalink. Hi Dr. Mogul. Interesting article. I’m taking a year long sabbatical in Colombia and was searching to see if others had done the same. It was quite difficult to find any articles and the medical literature is completely void of descriptions except for a Canadian Family doc that went to China in the 90s and a British GP that took one in Africa with little single paragraph descriptions. Maybe those taking sabbaticals don’t really want to write about it! I’m hoping to do a blog over the next year about my experience. I’d love to have you check it out and give any feedback!